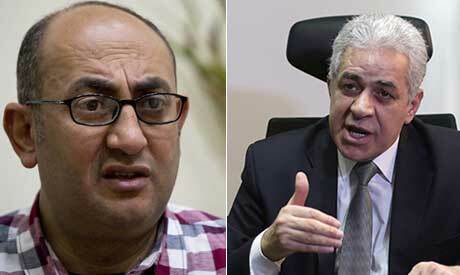 Former presidential candidate and leftist figure Hamdeen Sabahi has signed an election endorsement in favour of lawyer and labour activist Khaled Ali, supporting his bid to run in Egypt's upcoming presidential elections, Ali's campaign said in a brief statement on Sunday. Ali declared his intention to run for the presidency at a Cairo press conference earlier this month, calling on his supporters to collect the minimum required 25,000 citizen endorsements to support his bid. Article 142 of Egypt’s 2014 constitution states that a hopeful presidential candidate must secure the recommendation of at least 20 MPs or 25,000 citizens from 15 governorates, with a minimum of 1,000 from each governorate. Endorsements must be submitted to the National Elections Authority (NEA) by 29 January. Until now, only current President Abdel-Fattah El-Sisi has managed to fulfill the requirements for running in the upcoming elections, having secured the endorsement of over 500 sitting MPs and exceded the required citizens' endorsements from many Egyptian governorates. El-Sisi announced his candidacy for a second term during a national conference on Friday. Khaled Ali is currently awaiting a final verdict on a three-month jail sentence handed down for offending public decency after making an "obscene hand gesture" during a demonstration outside the State Council headquarters in January 2017. The final verdict in the case is set to be issued on 7 March. If the guilty verdict is upheld, Ali will be disqualified from the presidential race in accordance with Article 1 of the 2017 elections law, which prevents anyone convicted of a felony or a crime involving an "immoral act" from running for the presidency. Both Ali and Sabahi have run in previous presidential elections. Ali ran for president in the first round of the 2012 elections but received only 134,056 votes. Sabahi came third with 4.8 millions votes, or 20.7 percent, behind former Prime Minister Ahmed Shafiq, who came in second place, and Islamist candidate Mohamed Morsi, who won the presidency in 2012. President El-Sisi, whose first term ends in June, won the 2014 elections in a landslide victory, receiving nearly 97 percent of the vote over sole competitor Hamdeen Sabahi. The NEA will publish the preliminary list of candidates on 31 January in the Al-Ahram and Al-Akhbar newspapers.